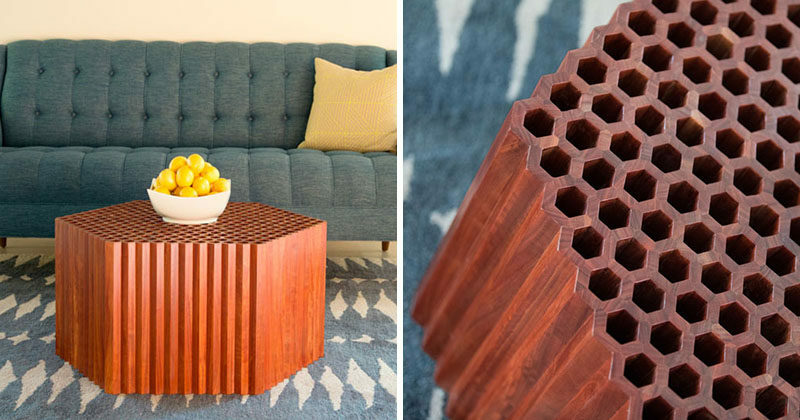 Los Angeles based furniture designer and maker Josh Neilsen, has shared his latest creation, the Honeycomb Table. It all started when Josh acquired a pallet of small oak strips that had been used at a winery during the fermentation process, and as a result, the strips were stained with the color of the wine creating an array of earth tones. Unfortunately the strips of wood were too small for traditional furniture making, so Josh, who is inspired by geometry in nature, created the Honeycomb Table after combining 1056 individual strips of reclaimed Red Gum Eucalyptus to make 662 hexagonal cells. Those cells were then hand-assembled and finished with natural oil and wax to make the sculptural table design, which is available as a coffee table and as a side table.